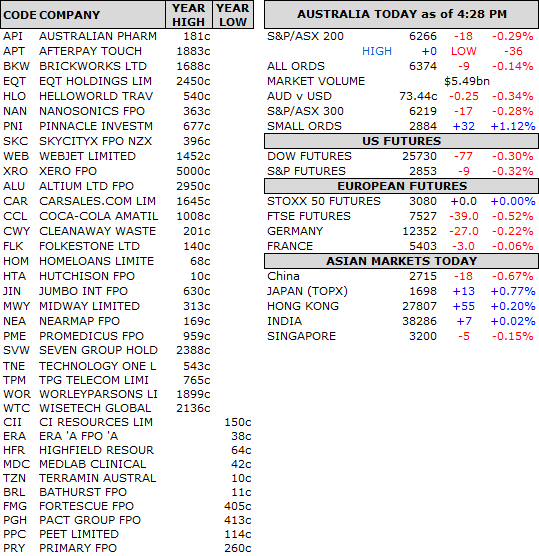 ASX 200 down 18 to 6266. High 6284 Low 6248. 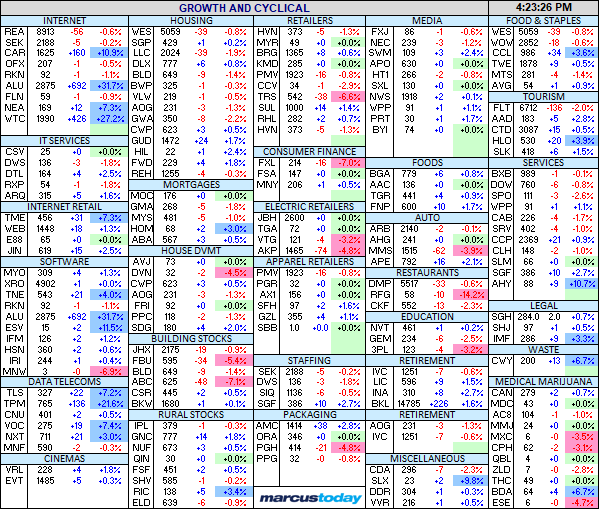 Off lows on PM survival. Tax cuts off the agenda. 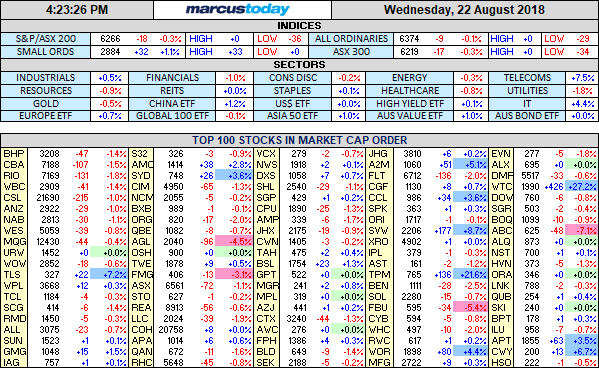 Shorts capitulate across the board in a crazy day for some. Telcos bounce on TPG merger news. AUD steady minutes to 73.44c. Aussie Gold firms slightly to $1626. US futures down 77 rallies slightly after Trump comments. Asian markets mixed with Japan up 0.77% and China off 0.67%. MARCUS CALL – The leadership challenge and how it affects the banks. Also, what to do with BHP? TRADING IDEAS – Three new trades. 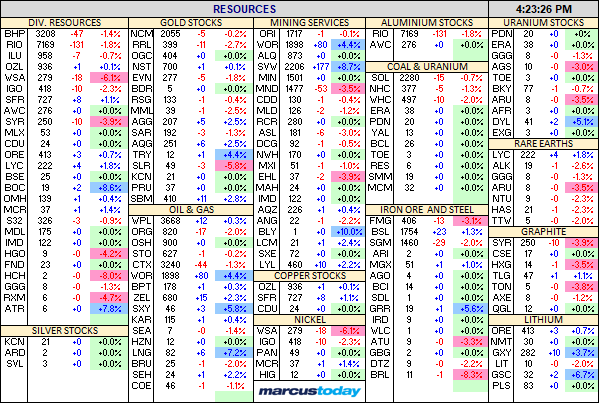 Three stop losses raised. Stopped out of BOQ. 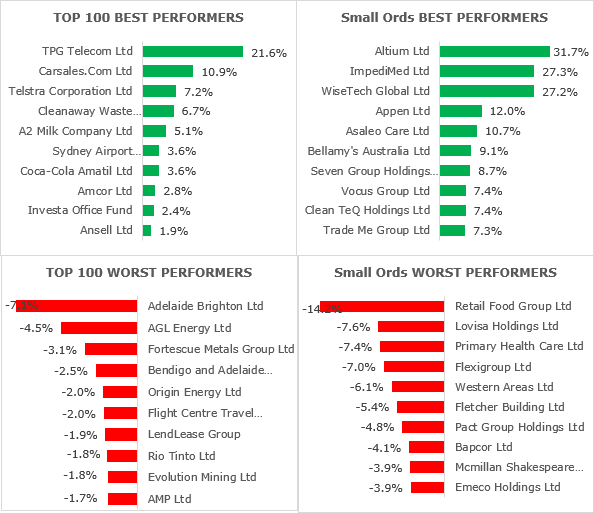 SMALL COMPANIES – One stock added to the portfolio yesterday, why travel and tourism is the place to be and one new member insight. HTA +51.67% rallies on Vodafone news. 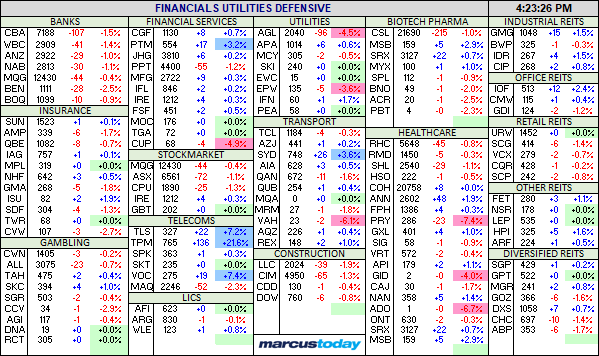 TLS +7.21% strong rally on industry consolidation. NEA +7.30% firms after briefing cheers. PPH +13.33% broker upgrades target. BAL +9.10% the worm has turned. APX +12.02% follows the A’s higher. WGN -13.17% on results looks overdone. ALU +31.70% results last night. Very good and shorts scamper to cover. PRY -7.36% puts entitlement issue to bed. 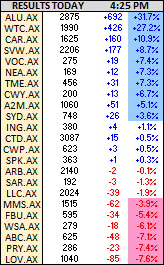 FMG -3.10% brokers cool after result. RFG -14.18% response to price query. AHY +10.69% broker upgrades following results. AGL -4.49% ex dividend and then some. ABC -7.13% not as easy it seems. Speculative stock of the day: Impedimed (IPD) +27.27% good move on good volume. No announcements yet. Seven Group Holdings (SVW) +8.72% FY18 results saw statutory NPAT +830% on year to $413.9m whilst underlying NPAT, excluding significant one-off items, was +54.78% on year to $330.6m. Underlying EBIT grew 67% on year to $496.9m, beating guidance of $470m and FY19 EBIT guidance is to be up 25% on FY18 EBIT. 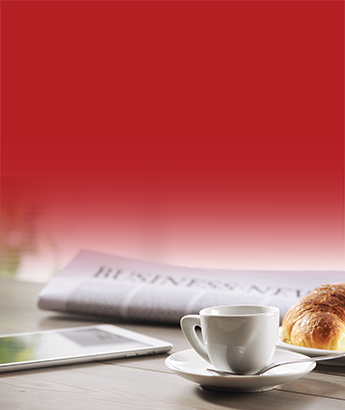 The final dividend of 21c is unchanged from the previous period, taking the full year dividend to 42c per share. The company is also proposing to convert its TELYS4 notes into ordinary shares, offering 4.6064 shares per note and the option to swap 50% for cash at a 15% premium. AMP (AMP) – 1.74% Has a new CEO in Francesco De Ferrari. Ferrari will replace interim CEO Mike Wilkins December 1st. Ferrari comes from 17 years at Credit Suisse where he was CEO South East Asia and Frontier Markets and Head of Private Banking Asia Pacific. Lovisa (LOV) -7.56% full-year profit after tax rose 23.8% to $35.9m. Revenue jumped 21.4% to $217m and profit before tax climbed 26.5% to $51.2m. 14 c dividend. Chairman Michael Kay will be stepping down on October 31, after two years in the role. Co-founder Brett Blundy will now join the board and assume the role of chairman. Ingham’s Group (ING) +1.06% a net profit for the full year of $114.6m, up 12.4% on a year ago. EBITDA rose 8.7% to $212m. Gross profit was up 4.4% to $476.9m. Final dividend, fully franked, of 11.6c a share, to be paid on October 4. Capital return of $125m pay back to shareholder of 33c and a positive outlook despite feed prices rising. TPG Telecom (TPM) +21.62% The company has responded to speculation of a merger withVodafone Australia. There are talks but no certainty of any transaction eventuating. Corporate Travel (CTD) +0.49% TTV up 19%. Revenue up 14% and underlying EBITDA up 27%. NPAT up 41% to $86m which is pretty much in line with estimates. Guidance EBITDA range of $144m-$150m with 15% – 20% growth. Market should like this result, at least the outlook guidance Final dividend 21c 40% franked. McMillan Shakespeare (MMS) -3.93% net profit fell 26% to $50.3m from $67.9m in financial year 2017. Revenue in the year ended June 30 climbed 4.2% to $545.4m from $523.44m a year ago. A 40¢ final dividend. Ardent Leisure (AAD) +2.81% Pro-forma net loss for the period July 1 2017 to June 30 reported a $88.6m loss from $62.6m a year ago. Pro-forma revenue from continuing businesses grew 16.1% to $59.7m. EBITDA pro-forma was a loss of $50.4m from a profit of $1.2m the previous year and EBIT was a loss of $106.8m from a loss of $53.8m. APA Group (APA) +0.60% full-year earnings climb 11.8 % to $264.8m on sales that edged up 2.6% to $2.386 bn. 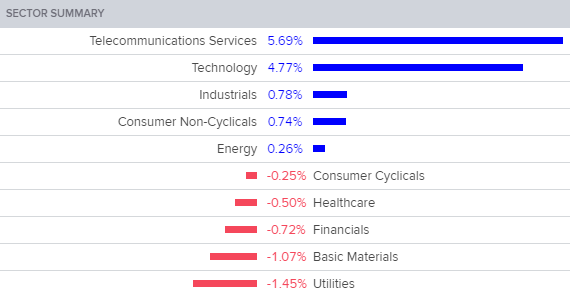 Earnings before interest, tax, depreciation and amortisation were marginally ahead of guidance at $1.518 billion, up 3.3%. 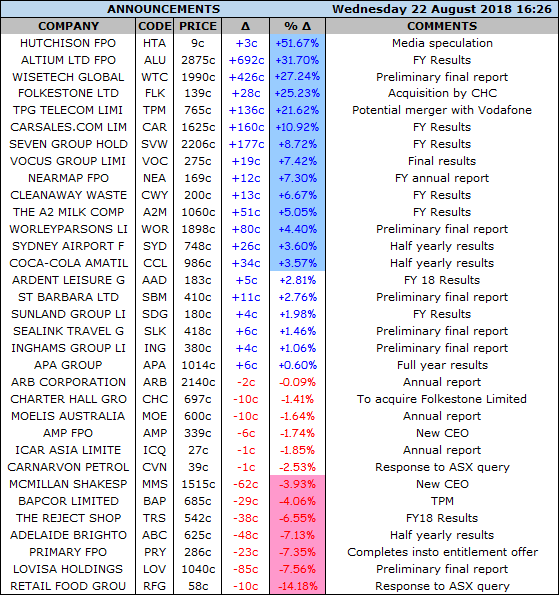 Sydney Airport (SYD) – 1H18 Results. Net profit up 4% to $174m. Revenue up 8% to $771m as they saw a 3% increase in passengers for the period. The company reiterates capital expenditure guidance of $1.3bn to 1.5bn for 2018-221. An interim dividend of 18.5c per share has been announced and guidance of a 37.5c full year dividend reaffirmed. Vocus Group (VOC) +7.42% FY18 Results. Net profit of $61.0m after last years $1.5bn loss. Underlying net profit down 17% to $127.1m. Underlying EBITDA of $366.1m, expected to stay in the range of $350m – $370m for FY19 as they focus on re-investing in the business to drive growth in FY20 and beyond. Revenue up 4% to $1.9bn. The company will not pay a final dividend. Coca-Cola Amatil (CCL) +3.57% Coca-Cola Amatil has posted a statutory net profit after tax for the first half of $158.1m, up 12.8 % on a year ago. EBIT rose 6.6 % to $257.2m. Underlying EBIT fell 4.9% to $297.5m and underlying NPAT fell 5.9% to $178.8m. Strong performance in New Zealand and Fiji. It will pay an interim dividend of 21c unchanged from last year of which 65 % is franked. Guidance to continue to target mid-single digit EPS growth. The uncertain impact of container deposit schemes in Australia and soft market conditions in Indonesia, will impact Group near-term earnings. Bapcor (BAP) -4.06% Net profit after tax rose 47.8% to $94.7m. Pro-forma net profit after tax from continuing operations up 31.6% $86.5m. Revenue from continuing operations up 22% to $1.24bn. EBITDA from continuing operations climbed 42.8% to $147.1m. A final dividend of 8.5c, fully franked, on September 27. Up 13.3% on a year ago. Lend Lease (LLC) –1.89% FY18 results saw NPAT up 5% to $792.8m and return on equity of 12.7%, towards the top end of the 10-14% guidance range, driven by strong performances across both development and investment segments. Full year dividend was up 5% to 69c per share. Nearmap (NEA) +7.30% FY18 results. The company’s net loss after tax worsened by 107% to -$11.1m as expenses increased by 46% to $62.4m despite revenue picking up 32% to $53.6m. The company saw record portfolio growth, as annualised contract value (AVC) increased 41% to $19.2m, with a strong performance in the US, accounting for 25% of the AVC, and a third of AVC owing to multi-year subscriptions. Adelaide Brighton (ABC) –7.13% The 1H result saw revenue up 11.7% for the half to $807.2m due to strength in NSW, QLD and VIC markets. Statutory NPAT was up 17.7% for the half to $84.5m whilst underlying NPAT was up 9.8% to $85.2m. The total dividend increased 53% to 13c per share, consisting of an increased final dividend of 9c and a special 4c dividend. Prime Minister Malcolm Turnbull has dumped his government’s signature economic policy after the Senate today blocked legislation to introduce a 25% tax rate for companies with turnovers above $50m. China now has 800m internet users more than India and the US combined. 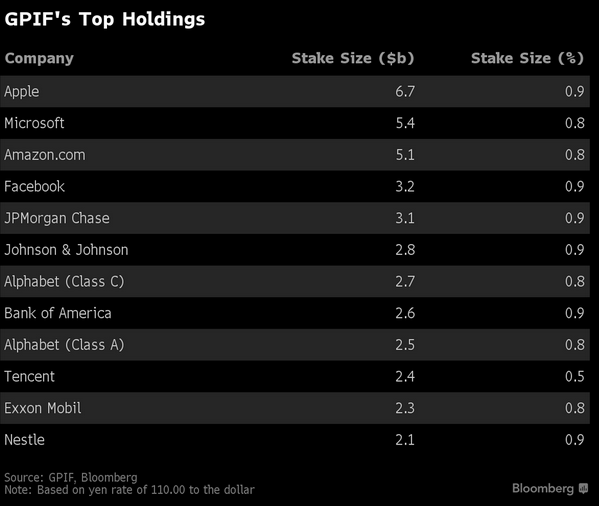 These are the stocks owned by the world’s largest pension fund, the Japanese government pension fund. 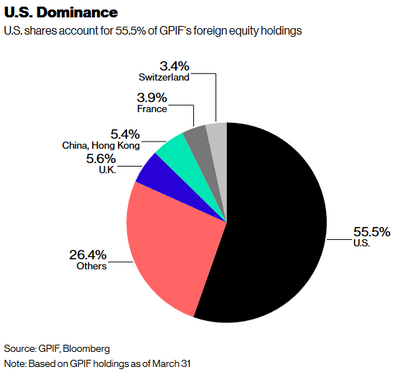 GPIF is now a top 10 shareholder in 265 firms outside Japan. 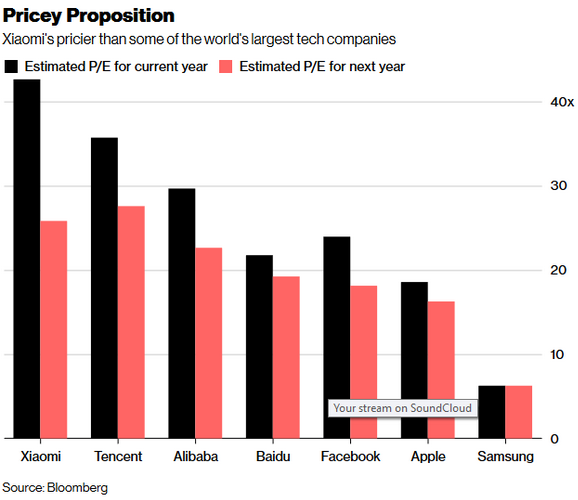 Recent glamour IPO Xiaomi a handset maker raised US$5.4bn by selling investors on its promise as a high-growth internet company. Gloss seems to be waring off after the stock is now down 19% since listing. Was pretty expensive. FTSE is expected to open down 18, DAX down 20 and CAC down 10. Expect Merkel to spit out her cornflakes as Trump announces the car tariff on BMWs. JP Morgan is planning to roll out a mobile brokerage platform next week that includes free research and some free trading to its millions of retail customers. A Republican congressman from California and his wife have been charged with illegally using campaign money on personal expenses. The Virtual Commodity Association, an industry group led by the Winklevosses’ own online cryptocurrency exchange, said it planned to “promote fairness, transparency, risk management, and liquidity” in the market.